and protects your wines Single zone stylish wine cellar by Avanti. ..
BACK IN STOCK! Avanti 30-Bottle Wine Cooler (P/N WC1500DSS). This 30-Bottle Front-Venting Mini..
Avanti 46 Bottle Dual Zone (P/N WCR5450DZ). It stores up to 16 bottles in the upper zone and u..
Avanti 50-Bottle Wine Cellar w/ Wood Trim (P/N WCR506SS). 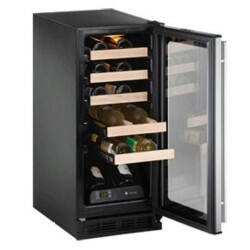 This mini cellar is designed to be f..
Danby Silhouette Wine Cooler Stainless (P/N DWC518BLS). This wine cooler is our most popular s..
Danby Silhouette Wine Cooler Stainless (P/N DWC1534BLS). Get rid of outdated trash compactors ..
U-Line Echelon Wine Cooler Overlay (P/N 2175BEVCOL-00). This beverage center offers 6 cubic fe..
U-Line Echelon Wine Cooler Overlay (P/N 2175WCCOL-00). U-Line understands that proper storage ..
U-Line Echelon Wine Cooler Stainless (P/N 2175BEVCS-00). This beverage center offers 6 cubic f..
U-Line Echelon Wine Cooler Stainless (P/N 2275ZWCS-00). This Wine Captain offers storage capac..
U-Line Echelon Wine Cooler Stainless (P/N 2175WCCS-00). U-Line understands that proper storage..
U-Line Origins Wine Cooler Stainless (P/N 1115WCS-00). U-Line's unique triple temperature ..
U-Line Origins Wine Cooler Stainless (P/N 1175WCS-00). U-Line's unique triple temperature ..
U-Line Origins Wine Cooler Stainless (P/N 1075WCS-00). U-Line's unique triple temperature ..
Enhances counter areas with designer styling,including a reflective smoked-glass doorIncreases the c..
At Last-a Dual Zone Wine Refrigerator for Your Countertop!Reds and whites, at perfect storage or ser..
Wine protection meets countertop convenienceEnhances counter areas with designer styling, including..